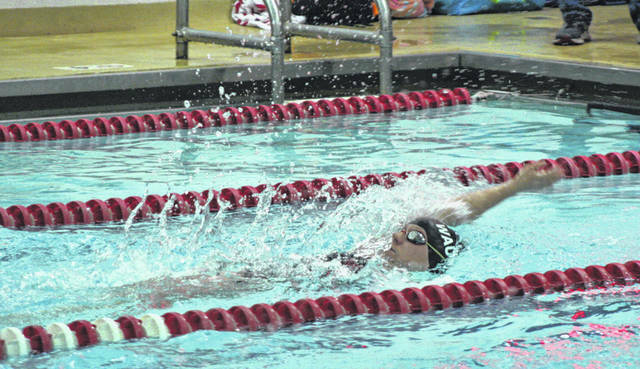 Megan Carroll of Wauseon swims in the 100-yard backstroke in a meet earlier in the season. On Tuesday during a home meet with Anthony Wayne and Bowling Green, she took second in this event. The Wauseon swimming and diving team picked up wins over Anthony Wayne and Bowling Green in a home tri-meet Tuesday. The boys earned a 103-73 win over Anthony Wayne and 106-54 victory over Bowling Green, while the girls bested Anthony Wayne 103-72 and Bowling Green 119-45. Winning events for the boys were Branden Arredondo in the 200 IM, Ryan Scherer (50-yard freestyle), Michael Cheezan (500-yard freestyle), Andrew Scherer (100-yard backstroke) and Caden Case (100-yard breaststroke. The Indians had winning teams in the 200-yard freestyle relay and the 400-yard freestyle relay. McKenzie Darnell won multiple events for the Wauseon girls. She was first in both the 200-yard freestyle and the 100-yard freestyle. Also winning for the girls were Myley McGinnis (100-yard butterfly), Ramah Witt (500-yard freestyle) and Brooke Schuette (100-yard backstroke). The girls won all three relays, taking home titles in the 200-yard medley relay, the 200-yard freestyle relay and 400-yard freestyle relay. 200 medley relay- 2. Wauseon (Andrew Scherer, Caden Case, Maddux Chamberlin, James Hutchinson), 2:15.9. 200 freestyle- 2. Andrew Scherer (W), 1:59.65; 3. James Hutchinson (W), 2:06.66. 200 IM- 1. Branden Arredondo (W), 2:15; 3. Maddux Chamberlin (W), 2:24.07. 50 freestyle- 1. Ryan Scherer (W), 23.24; 3. Caden Case (W), 25.59. Diving- 3. Cade Smith (W), 96.15. 100 butterfly- 2. Ryan Scherer (W), 56.57; 3. Maddux Chamberlin (W), 1:06.17. 100 freestyle- 2. Branden Arredondo (W), 53.29; 3. James Hutchinson (W), 56.22. 500 freestyle- 1. Michael Cheezan (W), 5:55.01; 2. Braden Vernot (W), 5:59.53. 200 freestyle relay- 1. Wauseon (Hutchinson, Case, Ryan Scherer, Arredondo), 1:35.77. 100 backstroke- 1. Andrew Scherer (W), 1:02.33. 100 breaststroke- 1. Caden Case (W), 1:12.9; 2. Michael Cheezan (W), 1:17.48. 400 freestyle relay- 1. Wauseon (Andrew Scherer, Chamberlin, Arredondo, Ryan Scherer), 3:31.59. 200 medley relay- 1. Wauseon (Carroll, Roelfsema, McGinnis, Duden), 2:08.72. 200 freestyle- 1. McKenzie Darnell (W), 2:01.6; 2. Brooke Schuette (W), 2:02.46. 200 IM- 2. Myley McGinnis (W), 2:38.62. 50 freestyle- 2. Sarayna Russell (W), 26.98; 3. Ramah Witt (W), 27.45. Diving- 2. Kennedy Nation (W), 168.97; 3. Madison Baugh (W), 132.3. 100 butterfly- 1. Myley McGinnis (W), 1:11.34; 2. Maggie Roelfsema (W), 1:15.54. 100 freestyle- 1. McKenzie Darnell (W), 57.46; 2. Sarayna Russell (W), 58.82. 500 freestyle- 1. Ramah Witt (W), 5:40.03. 200 freestyle relay- 1. Wauseon (Russell, Carroll, Schuette, Darnell), 1:45.04. 100 backstroke- 1. Brooke Schuette (W), 1:09.96; 2. Megan Carroll (W), 1:11.16. 100 breaststroke- 2. Maggie Roelfsema (W), 1:21.22; 3. Maggie Duden (W), 1:23.09. 400 freestyle relay- 1. Wauseon (Russell, Witt, Schuette, Darnell), 3:50.6.